Using the forces of Earth, and life-force, "Spell Tattoos" requires chants, gestures, and a special talisman to be activated. They can summon gusts of wind, bursts of fire, temporary shields from arrows and weapons, summon traps, along with others (Other spells incorporated to the tattoo). Different combination's can alter the casting in various ways. With a combination of certain tattoos, one can use electricity, fire, and wind to deconstruct organic and inorganic materials. It matters on the caster to design the tattoo according to the spell. This is a substitute for having to weave, but, the knowledge to actually make a complex spell tattoo is very rare and highly likely not going to be shared. Various symbols represent different types of magic, or combination. 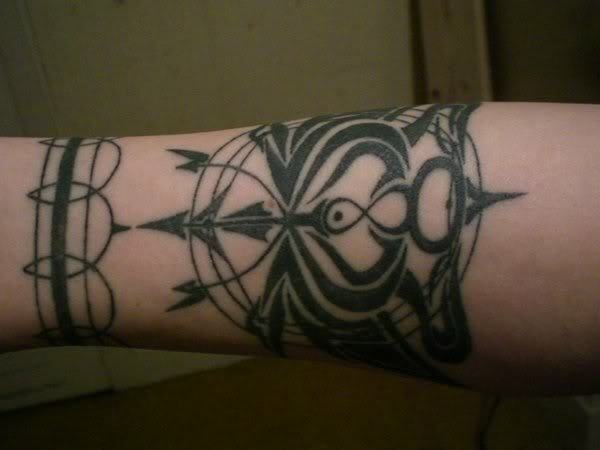 Circular tattoos with intricate patterns represent magics, while a tattooed band is a combiner of the circles. Two circles are required to band a "spell" together. That's Jack's farm city. He gets more populace if people click the link daily. Good. Got the original idea from FMA. WHY CAN I NOT BURN THE LITTLE HOUSES? That farm-thing is gay now. I don't like how it's bright red on white, make it a darker color. Suggestion bands and ideas go straight to my PM box please. Could you add how you even make a spell tattoo and what kind of skills and such you need to make one? Also who could provide you with one, and if you can take an existing tattoo and form it into a spell tattoo, Like a bear tattoo that increases your strength in times of need and such. You obviously didn't read my post to begin with, so I'll grab a few things from it. Skills to make one "but, the knowledge to actually make a complex spell tattoo is very rare and highly likely not going to be shared." Who can provide one? Last answer provided that... And no, a bear tattoo can not do that. These are not runes, merely a way to instantly use a powerful weaved spell. Going back to who may actually be able to make them.. Would be a very, very, powerful and old sorcerer, possibly the arch-mage, arch demons (If properly trained) and that is about it. There is a 0% chance of even making yourself one with no experience, you'd most likely make some odd weave combination that forces power to your arm and makes you explode. The more complex the spell, the larger the tattoo, necromancers would most likely have to be mageblooded, since the tattoos for that would cover the majority of the body. To correct you, a more complex spell tattoo requires an extremely intricate, delicately designed tattoo consisting of multiple layered chains in various designs to work at maximum power. Your run of the mill necromancer would not have any knowledge of the art of Spell Tattoos unless he was trained by an Archmage, Daemon, or extremely skilled tattooist who had an encounter with some sort of spiritual entity to acquire that ability. Here is my previous quote. There is a 0% chance of even making yourself one with no experience, you'd most likely make some odd weave combination that forces power to your arm and makes you explode.